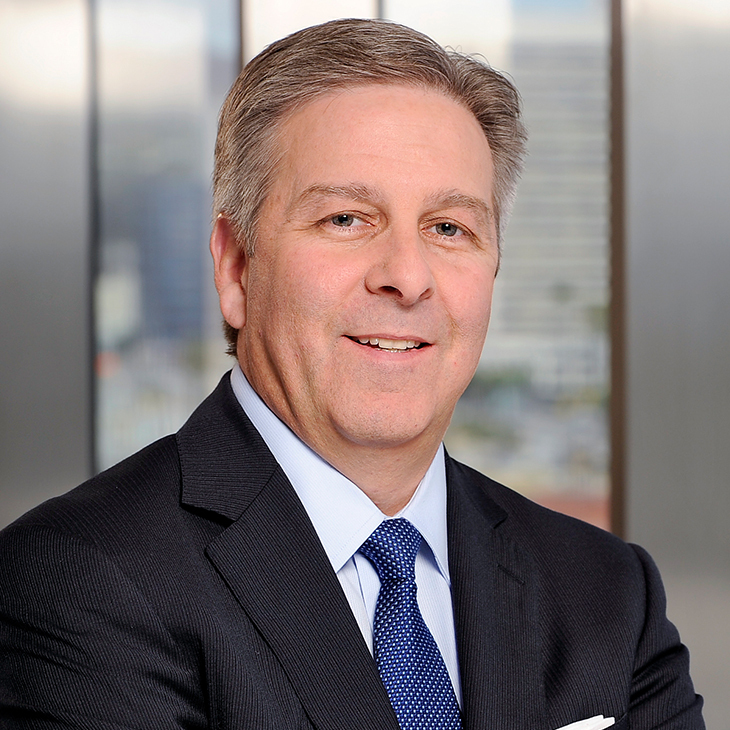 John M. Gatti is a partner in the firm's entertainment litigation practice and resident in the Los Angeles office. His practice includes 31 years of litigation and trial experience in state, federal and bankruptcy courts as well as representing individuals and corporations in complex business and commercial lawsuits. John has trial experience across a variety of industries, with a specific emphasis in the entertainment, media and sports industries. John’s experience in the entertainment, media, sports, Internet and gaming industries includes representation of studios, television networks, film financers, talent, gaming and sports entities, and independent entertainment production companies. These representations include actions for breach of contract; unfair competition; copyright and trademark infringement; profit participation claims; idea submission claims; and media torts, including defamation, invasion of privacy, right to publicity and use of celebrity name and likeness in all media, including the Internet. John has been repeatedly named one of the Top 100 Influential Attorneys in Entertainment by The Hollywood Reporter and recognized as a Super Lawyer. Alan Ladd, Jr. et al. v. Warner Bros. Entertainment—Represented the plaintiffs, including Alan Ladd Jr., former chairman of MGM Studios and two-time Academy Award–winning producer, during four years of litigation culminating in a four-week jury trial. The verdict was 12–0 in favor of plaintiffs in an entertainment industry precedent-setting case involving the methods of allocation of television licensing fees to films packaged with other films. The jury verdict found that plaintiffs’ films, including Blade Runner, Chariots of Fire and Police Academy, had been underallocated by Warner Bros. in the total amount of $96 million. In addition, the jury found by 12–0 vote that Warner Bros.’ licensing practices breached plaintiffs’ contract and violated the implied covenant of good faith and fair dealing pursuant to California law. This jury verdict was the first of its kind and has had significant ramifications for the entertainment industry. On May 25, 2010, in a partially published opinion, the California Court of Appeal upheld the jury verdict in a 3–0 decision. In addition, the Court of Appeal remanded Ladd’s claims of fraud, breach of contract for loss of credit and improper accounting for trial before the fact-finder. The California Supreme Court denied Warner Bros.’ petition for review. BATJAC Productions, Inc. v. CBS—Defended CBS against net profit claims made by John Wayne’s heirs. Brown v. CBS Studios, Inc.—Represented CBS in a copyright dispute challenging CBS’s ownership of the theme song to the iconic television show Hawaii Five-0. The plaintiffs dismissed their claims with prejudice. American Federation of Musicians of the United States and Canada (“AFM”) v. MGM; Columbia Pictures Industries—Represented MGM and Columbia Pictures in this action filed by AFM, the guild representing musicians responsible for scoring films. This case alleged that MGM and Columbia Pictures breached AFM’s 2010 collective bargaining agreement with the studios by producing the movies Carrie and Robocop in the United States but allegedly scoring the movies outside the United States. The case was significant because it had the potential to impact how all studios interpret the AFM collective bargaining agreement as it relates to production activities. Twentieth Television, Inc., Twentieth Century Fox Film Corporation (collectively, “Fox”) v. Bay City Television, Inc., and Grupo Televisa (collectively, “Bay City”)—Represented Twentieth Century Fox Film Corporation as a plaintiff in connection with litigation involving nonpayment by Bay City Television and Grupo Televisa S.A.B. of over $20 million in licensing fees owed for the broadcast of King of the Hill and The Simpsons on Channel 6 in San Diego. The case involved litigating Fox’s contracts giving it sole discretion to license its programming as it determines. AFM v. Columbia Pictures, et al.—Resolved a significant matter for Columbia Pictures in a federal court action filed by AFM against Columbia Pictures and most of the major studios in AFM v. Columbia Pictures, et al., Case No. 2:15 cv 03953. AFM’s claims reached into the multimillions because of the extensive licensing activities at issue. Branded LLC v. Clique Media, Inc.—Represented Clique Media, Inc., against trademark infringement claims involving Clique’s use of its trademark for “mydomaine.” Clique Media is a leading Internet fashion publisher owned by Michael Eisner’s The Tornante Company. This case was significant because it addressed complex trademark rights and the ability to exploit those rights in digital media. The case involved cutting-edge digital and Internet publishing and marketing rights. Haber Productions, Inc. v. Fall Line Entertainment—Represented plaintiff in a five-week jury trial for the producer on an idea submission claim, leading to a jury verdict of $5 million in favor of our client, including punitive damages. Williams v. CBS—Defended CBS against copyright and trademark infringement claims. Summary judgment was granted in CBS’s favor in the published opinion Williams v. Columbia Broadcasting Systems, Inc., 57 F. Supp. 2d 961 (C.D. Cal. 1999). Corrie Sanders v. Lamon Brewster, WBO—Motion to dismiss granted and injunction denied in favor of our client, allowing the client to compete for the WBO Heavyweight Boxing Championship. Baker v. Twentieth Century Fox—Defended the studio and television network against idea submission claims. The case was dismissed in our client’s favor. Sheldon v. Columbia Pictures Television, Tony Danza, et al.—Defended studio and television producers against idea submission claims in a four-month jury trial. Sunset Health Products v. Spectrum, et al.—Represented the diet drink distributor in a federal trademark and trade dress action. Representation of individuals, corporations and partnerships involved in complex business litigation. Representation in matters involving trademark and trade dress protection for various products. Representation of construction subcontractors in complex litigation involving the construction of metropolitan transportation lines. Representation of high-net-worth individuals and corporate clients in employment litigation, including trade secrets and right to compete. Representation of film and television companies in entertainment guild arbitrations. Speaker, “The Cases that ‘Rocked’ the Entertainment World in 2018!” Beverly Hills Bar Association, 2018 Entertainment Year in Review, January 17, 2019. Moderator, "Creating New Strategy for Massive IP," VRS Conference, October 16, 2018. Panelist, “Recent Digital Media Trends and Their Impact on the Entertainment Industry,” ACC’s Sports and Entertainment, June 22, 2016. Guest Lecturer, "Privacy Torts, the Internet and First Amendment Issues," Loyola Law School. Guest Lecturer, "Privacy Torts, the Internet and First Amendment Issues," University of Illinois Law School. Guest Lecturer, "Current Legal Trends in the Entertainment Industry," Southwestern University Law School. Author, "Legal Ramifications of AR and VR—Déjà vu All Over Again," AR/VR Magazine, May 31, 2018. Coauthor, “Sizing up 2014's copyright cases,” Daily Journal, December 31, 2014. Coauthor, “After 20 Years, Has Transformative Use Lost Its Edge?,” Daily Journal, November 5, 2014. Coauthor, "Second Circuit Deals Blow to Rights of Broadcasters Under the Copyright Act," Intellectual Property Technology Law Journal, July 2013. Coauthor, "Governor Schwarzenegger Signs New Anti-Paparazzi Legislation," Privacy & Data Security Law Journal, January 2010. Author, "Cybersquatting," Producers Guild of America Publication, 2007.